Brothers Paul and Ian Hopkins travelled to the Old Bridge Inn at Ripponden last month with butchers from many parts of the country carrying a precious cargo of pork pies. They were among the 40 contestants from counties like Shropshire and Derbyshire for the Pork Pie Appreciation Society championships. 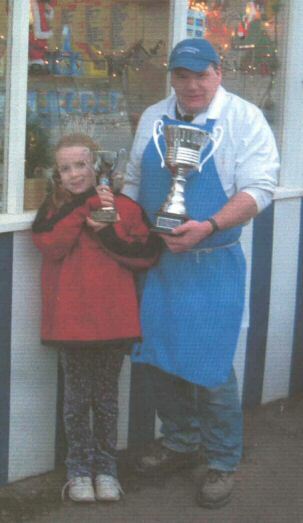 They came away with another top award to join the collection of shields and certificates which decorates their butcher’s shop at Birkenshaw which they have run for eight years. Paul Is president of the Bradford and District Butchers’ Association and both brothers are flag-wavers for the cause of the small butcher. Figures show that the number of independent butcher’s shops has drop­ped dramatically in recent years despite the fact that the small butcher can offer a personal service. For example, butchers shops are currently giving away free recipes. Paul and Ian, for example, know most of their customers by name, get to know how they like their meat, and are happy to give tips on cooking and aim to keep their prices as keen as those in supermarkets. Like many independent butchers, Paul and Ian prefer to make their sausages in the traditional way. Paul says their prize-winning recipe evolv­ed over years. Their reward is that customers travel from outside the area to stock up on these savoury treats. One visitor from Canada, who visits his parents In Bradford can’t wait to sample the pies on each of his trips.